Neo-Pagans are often lumped together with the New Age movement. While the two movements do overlap somewhat, they are distinguishable. Neo-Pagans are typically critical of the New Age movement for its emphasis upon light, mind, spirit and transcendence to the detriment of darkness, body, matter and immanence. Neo-Pagans reject the New Age quest search for perfection and mastery, and seek rather than an engagement with ambiguity and finitude. According many New Agers, there is a cosmic struggle between the forces of Light and Darkness, and human evolution depends on humanity thinking positively, embracing the “light” and spirit and abandoning the darkness and the earth. Neo-Paganism, on the other hand, rejects this gnostic denigration of matter and darkness, and celebrates the world as it is. New Agers seek to escape into an eternal light-existence. For Neo-Pagans, however, darkness is necessary: life is born in the dark womb, seeds germinate in the dark soil, it is in the dark night that we dream, and it is the Black Goddess who is our original mother. Neo-Paganism celebrates the beauty of nature and does not flinch from the fact that it is “red in tooth and claw”. In the eyes of Neo-Pagans, the dark is understood, not as evil, but, like the winter and the night, a necessary feature of our natural world and our spiritual being. While there are many similarities between Neo-Paganism and the New Age movement, there are also some other crucial distinctions between two movements. 1. Both movements arose out of the Sixties Counterculture movement. 2. Both draw upon the 19th century Romantic movement. 3. Both disdain traditional religious practices. 4. Both were strongly influenced by Jungian psychological theory; both tend to view the unconscious as the meeting ground of the human and divine. 5. Both are concerned with experiencing a regeneration or renewal of life. 1. Neo-Paganism is more overtly religious than the New Age. 2. The New Age movement tends to eschew religious ritual, while Neo-Paganism embraces it. 3. Neo-Paganism emphasizes links with ancient pagan religions, ritual celebration of the cycles in nature, and polytheistic conceptions of divinity. The New Age movement does none of this. 4. Neo-Paganism gives the Goddess a central role in conceptions of divinity, whereas the much of the New Age movement tends to be more patriarchal. 5. The New Age movement tends to dismiss this world, including nature, as illusory, adopting a transcendental (Theosophist) position, whereas Neo-Paganism embraces the world. 6. The New Age movement eschews psycho-spiritual darkness for light, whereas Neo-Paganism embraces darkness as part of the natural cycle. 7. The New Age movement places greater emphasis on the (re-)union with the ultimate divinity than does Neo-Paganism. 8. 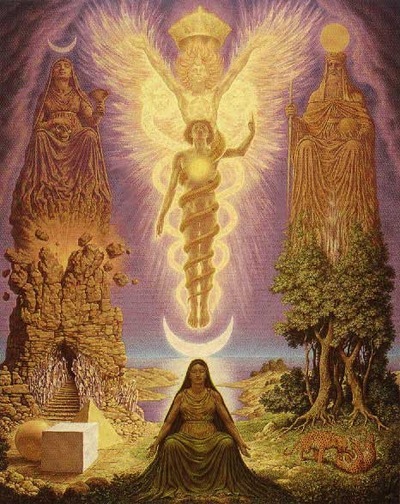 The New Age movement conceptualizes personal growth more in terms of ascent or transcendence, whereas Neo-Paganism conceptualizes it as cyclical and involving a descent into the unconscious or the marriage to the Goddess, usually followed by a return. 9. Although both Neo-Paganism and the New Age movement encourage a journey to the inner self, Neo-Paganism also encourages a journey outside the self to commune with the Other, including other people and the natural world. 10. Neo-Pagans place greater emphasis on one’s responsibility to other beings, human and non-human, and the environment, than does the New Age movement.